What Do Cows Say About Us? When moving through a rural landscape, be it the rolling hills of South Africa, the green English midlands, the feed-lots of the American midwest, or the wet rice paddies of South India one is bound to see some cattle grazing. Ruminating on grass or fortified corn-based feed: digesting it, regurgitating it and then digesting it once again. Ever since I met a cow in Southern India in 2005, I have been ruminating too, that is, reflecting on what these particular cows reveal about us. A cow's fortune is vastly dependent on which field or feed-lot it stands in. In the American feed-lot the cow is bound to a cruel destiny to fuel a demand for unnecessary animal-based food and fashion products. The cow in the English meadow would share a similar fate, although if she is a dairy cow, she will suffer the loss of at least four calves taken away after birth. She will be perpetually pregnant, will undoubtedly suffer infection of her udders and finally be killed for meat and leather, but not before her milk is sucked away to become a smorgasbord of dairy delights for un-weaned cuckoo-like humans. We need this milk no more than we need pig's milk, or dog's milk, or cat's milk. In fact all this suffering happens to produce a food-stuff that is one of the leading contributors to growing incidence of everything from acne, cancer, heart-disease and osteoporosis. Despite the suffering of a large majority of our bovine brethren around the world, there are still places in which cattle receive a better deal. The cow in a family run farm in South Africa, may well have access to large open grazing, the ability to roam in herds and form part of a long family legacy. The Nguni cows I have met in the wild coast of South Africa roam free and are herded into a safe kraal (a traditional wooden pen) at night. They will experience less intrusive milk extraction than their western cousins, and will almost certainly receive a beautiful Nguni name which is inspired by their unique colouration, horn shape and character of the individual. The naming practice reveals much of traditional isiXhosa life, for example:imasenezimpukane - has a white body with tiny black freckles; her name means 'the flies in the buttermilk'. Bafazibawela has a chestnut upper body, with white legs and white underbelly. Her name means "women crossing the river". Although these cattle will eventually be slaughtered sometime in their life, it will be sacrificial process for a traditional ceremony such as a funeral or wedding. In this context their lives are still ours to own and cut short. We might still separate calf and mother for periods, but for the most part they will live a life more dignified than their American-feedlot and English Dairy cousins. She will have a name that reflects the world she lives in and will be respected as an individual, as apposed to the young male calf who will be just a number, his numerical name branded into his flesh, like #269 in a dairy farming context in Israel. In South India I witnessed a massive contrast to the quality of life a cow experiences, from how she is treated and what rights she she has, to her basic biology. Every aspect of her life is respected and revered with much love and warmth. A South Indian cow roams free, no single person 'owns' her. She rather 'chooses' those she will live with. Her horns and hooves will be painted with colourful chalk, she will not only graze freely, but will receive brass-bowls of 'offerings' on the doorsteps of devout households. Special blessings and the ability to sleep where ever she feels fit is what she will experience in South India- so much so that traffic will come to a standstill to afford a cow a moments rest if she so decides. In South India the majority of people recognize cattle as sacred. They live a ferrel life, free from any aggressive manipulation and are awarded the basic right to life. What was most startling when examining the differences between South Indian and other cattle abroad, was their size. 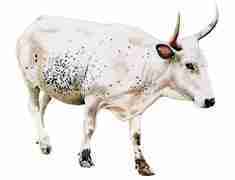 South Indian cows are at least a third the size of their relatives abroad. 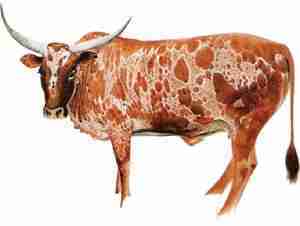 These diminutive cows have slender features, they are lean and move more like antelope than livestock. I couldn't help but wonder why they were so much smaller? After some more ruminating the answer stared back at me, as if it was my own reflection. 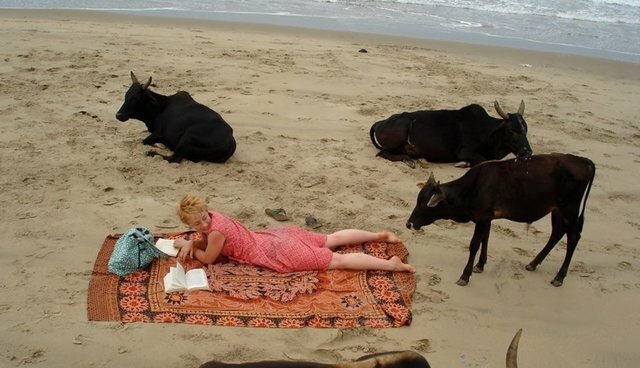 --Small South Indian Cows seeking out the company of my close friend Leanne Brady, on the Beach in Karnataka Province, picture courtesy of Leanne Brady They were smaller because of how they were seen, by what rights they were afforded, how they were treated and what place they held in society. South Indian Cows are not killed for meat or bred for the specific purpose of milk, they are respected as what they inherently are: cows- sentient beings, not food. They haven't been bred over time according to our wants they are not seen as property, neither are they seen as a commodity. 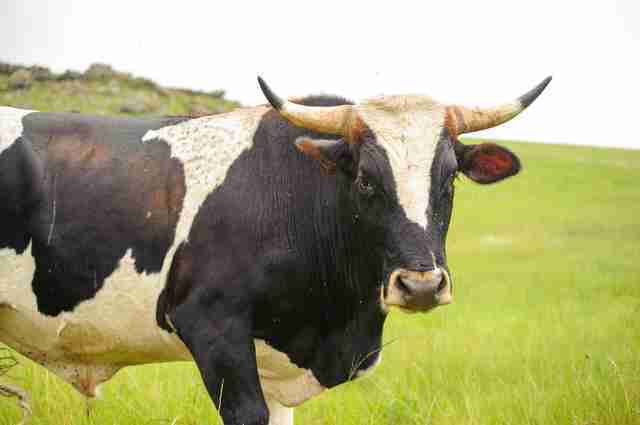 --An Nguni Cow in Maclear, South Africa taken by friend Scott Martin. This place for him is one of his favorite places in the world, and would not be what it is without the cattle that roam there. Elsewhere we select for big muscles, large body size, particular skin colour, massive mammary glands and overactive hormones to increase milk productivity. We have shaped the cows that we know today according to own own whims and fancies, much in the same way as we have shaped dogs, cats, chickens and other domestic animals. 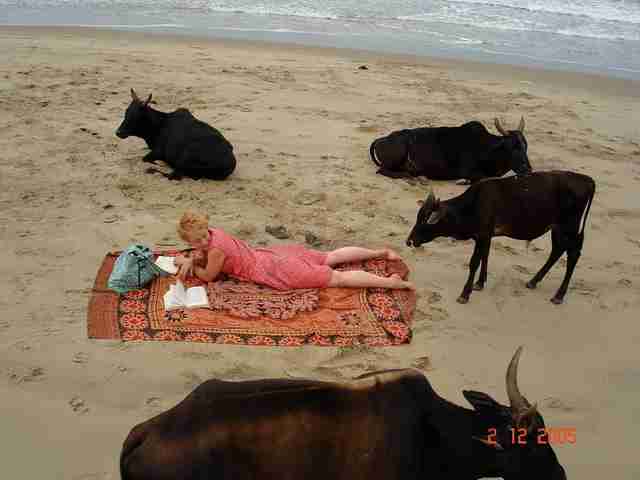 Cows in India have not been interfered with in this way. South Indians do not select for a specific morphological quality, but rather let the cattle be, and in turn find a way to live together. These cattle behave more like dogs and cats than cows I had met elsewhere. They are affectionate, they rub up against you as a passing cat would. They nudge gently, and show obvious delight when scratched behind their ears. So what does this say about us? I think it says many things, much of which you would discover yourself by spending a moment with a cow. It is no unlike staring into a mirror, one that reveals our priorities, our tastes, our aesthetics, our addictions and our respect for life. We can see by her shape, her udder size, her uniformity, her overall body size and her level of fear or affection, just what people prioritize in that place. 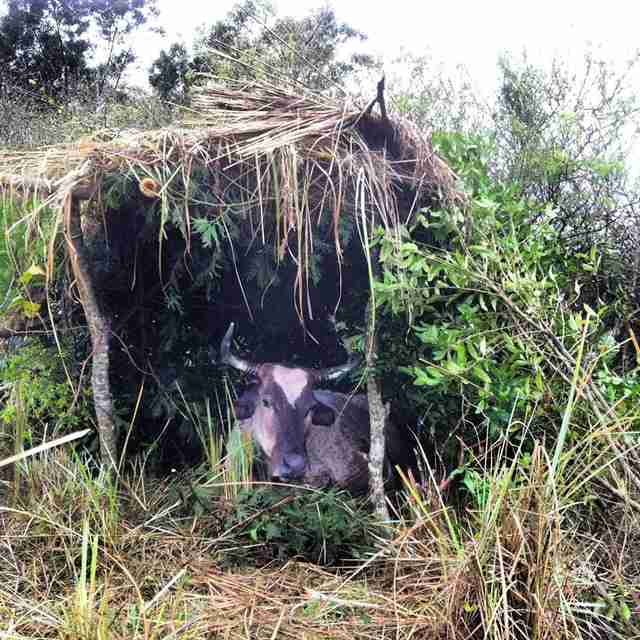 --A shelter made for an elderly cow in the Eastern Cape, South Africa. Picture courtesy of Leanne Brady. The cover photograph of this article is taken by a friend Erika Turvey Swart on a farm called Bekendvlei in the Tuinplaas rural community in Limpopo province of South Africa. The little boy is Marthinus Wessel Swart, the grandson of Unetsie Turvey. He is the fourth generation of a family of cattle farmers. Whenever his mother cannot find him, she immediately walks to the cattle, and can find Marthinus there sitting among his friends. His relationship with the cattle on his farm is now being shared with his younger sister, who joins him in the Kraal to sit and be among the cows. When he sits there amidst these massive creatures I wonder what he sees, and how this reflection looks compared to what his parents or grandfather sees in the cows. 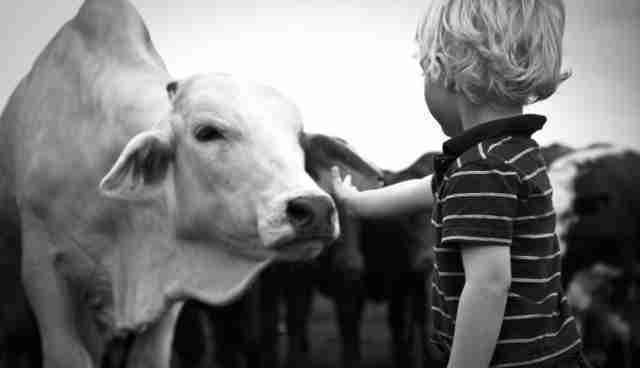 I wonder too, if his grandfather spent time with the cattle in the same way his grandson and granddaughter now do and perhaps how his reflection has changed as he grew up and had to live and keep the farm productive in the complex realities of our modern economic culture. This leaves me with even more to ruminate, reflecting on what this world could look like if all of earth and those living on it was not considered property? If animals had the right to life? Even more fascinating to me is what would We be like in this scenario? 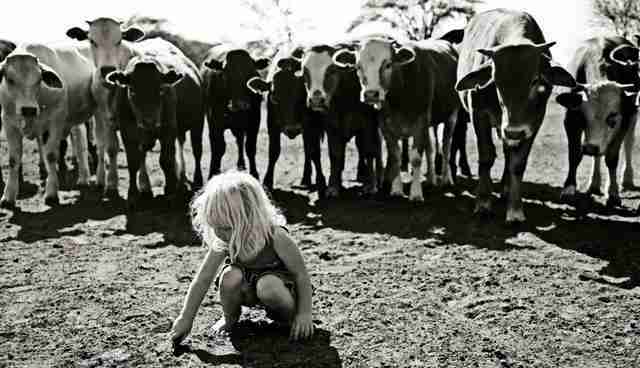 What would we see reflected back at us, when looking into the eyes of a ruminating cow that was not ours to own?